Are you looking for easy to use zoom & annotation tool for use during a presentation? ZoomIt is a handy and portable tool that allows smooth screen zoom. You can move mouse in zoom state to focus on specific part of the screen. Then click and draw arrows or other freehand figures to grab audience attention. 1. Download ZoomIt tool [weblink] & unzip the file. 2. Launch the program, it will sit on the system tray. 3. Press Ctrl + 1 key to zoom screen & ESC to return normal. 4. In zoom state left click to start drawing freehand figures. You can draw multiple figures and use Ctrl + Z to undo last drawn figure. 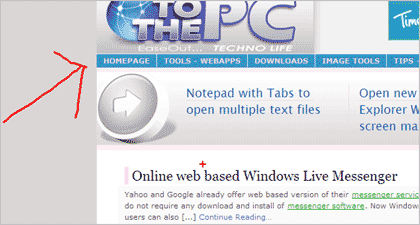 Use ESC to remove all figures and return to normal screen state. 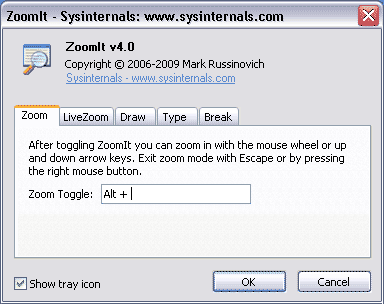 While in zoom state you can control the level of zoom by using Ctrl + Up arrow key for more zoom and Ctrl + Down arrow key for less zoom. One quick tool for use during presentations to draw audience attention to points of your choice by zoom and annotations. Also see another portable tool QZoom for Mac like Zoom in Windows.